Do you have a patio you want to enjoy all summer long? Do you find yourself bothered by the bugs that frequent your patio space? Do you feel like the insects are taking over a part of your home that should be yours? Each stick burns between 2.5-3 hours. Perfect for garden parties, outdoor eating, and romantic evenings. Last update on 2018-11-30 at 13:57 Product prices and availability are accurate as of the date/time indicated and are subject to change. Any price and availability information displayed on [relevant Amazon Site(s), as applicable] at the time of purchase will apply to the purchase of this product. If this sounds like your situation, we’re here to help! In this article, we’ll introduce you to four great options to help you fight back against the bugs without having to resort to harsh chemicals and sprays to do so. All of the options listed below are kid and pet safe, and they’re sure to help you do battle no matter how big and intimidating the bugs might be where you live. But what kinds of bugs do you have to deal with on a patio, anyway? Why are patio spaces prone to bugs? Patios draw insects of all types because they’re mostly outdoors as it is. The bugs already live outside, and your patio is exposed to the great outdoors more than the rest of your home. And the more food you put out on your patio, the more likely it is to attract bugs, too. Which is the best bug repellant for patio use for the type of bugs you have? Whether you have mosquitos, roaches, flies, gnats, ants, or some other bug problem altogether, you’re sure to find a good solution from our products listed below. Take your time and compare each one to see which will work for your needs. 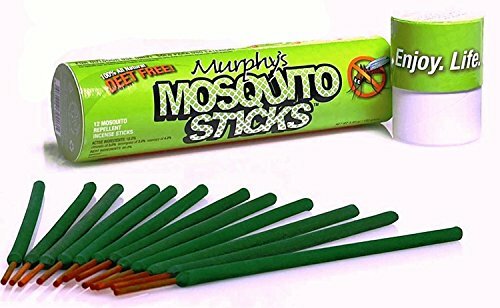 Bring home a pack of Murphy’s Mosquito Sticks to give yourself plenty of pleasant smells to enjoy as you fight the mosquitos and other flying bugs on your patio. 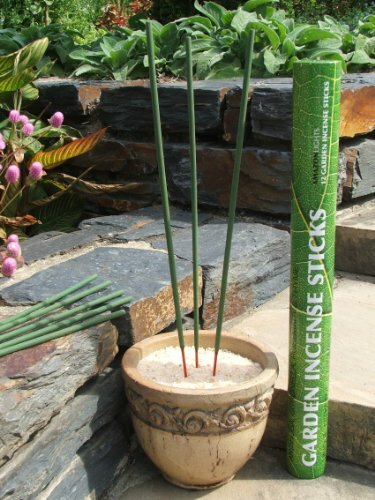 These sticks are made of bamboo with rosemary, lemongrass and citronella. They are designed to burn for about two hours at a time and provide a tried-and-true method of keeping bugs away while you spend time outside. Many customers report these sticks working well for the two hours specified on the packaging. This is an all-natural method of keeping the bugs away without having to resort to chemicals. Although most people enjoy the smell of these sticks, it can be overwhelming to those who have very sensitive noses or who suffer from smell-induced migraines. You will need to stock up on plenty of these if you plan to use them for a whole patio. You can’t go wrong with some good old citronella, and with the Amazon Lights All-Natural Premium Citronella incense sticks, you’re sure to be able to enjoy hours of relaxation on your patio unhindered by bugs. This is an all-natural incense derived from plants and includes other pleasant smells such as thyme and rosemary. Best of all, the products used in these sticks are sustainable so you don’t have to worry about doing harm to the environment when using them. These sticks burn about three hours depending on the strength of the wind while they’re burning. The sticks are very easy to just light, place in the ground or in some sand, and enjoy. Some sticks may arrive as “duds” that won’t light or won’t stay lit for long, although this is uncommon. Some customers recommend using more than one of these products at a time for best results. If you’re looking for something that looks nice on your patio and can still help you battle your pest control problem, try this Thermacell Patio Shield. This product is designed to look like a lantern and even offers some soft, muted lighting with built-in LED lights. It also emits mosquito repellant by way of a replaceable cartridge that goes inside the lantern itself. As the lantern glows, it also works to keep mosquitos at bay. This product is available in several colors to help you match the look of your patio or backyard setup. Many customers have reported this product working well for mosquitos as well as gnats and flies when camping or spending time outdoors. This product does require the cartridges inside to be replaced now and then, so it will be a long-term investment rather than a one-time purchase. Some customers dislike the overall construction of these lanterns and feel that they’re too flimsy to be worth the price. 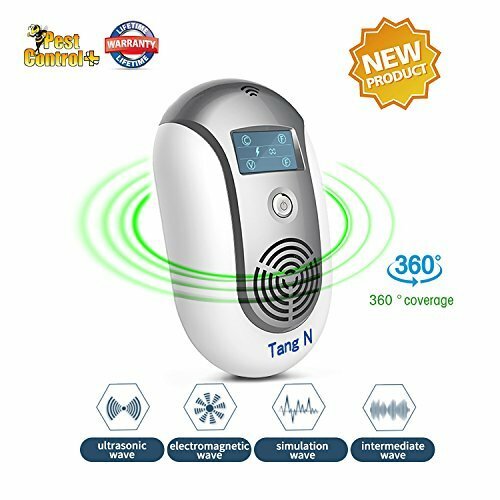 Try this Ultrasonic Electromagnetic Pest Repellent for a unique take on getting rid of bugs from your patio. This product is designed to get rid of insects and other pests by emitting a tone that only they can hear. This tone is painful or irritating to the pests in question and encourages them to leave your patio alone. You simply plug this product into a socket and turn it on, and it does its job as it is meant to. It can be used for dents, spiders, insects, and even bats if you have a problem with these types of pests. This product is designed to be safe for use around pets and young children as well as everyone else in the family. This is a good option for anyone who is looking for pest control without using chemicals or being harmful to the pests themselves. Many customers have reported this product not working for them, as it usually can’t permeate walls to get to the root of the pest problem. Some products have been known to stop working after just a day or two of use in rare instances. As you can see, there are a lot of great solutions out there depending on the types of bugs you’re dealing with. Some of them are more likely to work for your patio and yard than others, so you might want to try more than one option to see which one is best for your specific situation. If you’re wondering which of these is best overall, remember that it’s going to depend largely on the pest you’re dealing with. If you have roaches or ants, you may be better off using the Ultrasonic product. However, if you have mosquitos, the citronella sticks are usually the way to go. For flies and gnats, the lantern with the repellant cartridge may be your best option. If all else fails, there’s no harm in picking a few to try at the same time. With the combined efforts of all or some of the options listed above, you’re sure to have great results and be able to enjoy your patio space bug-free for as long as you want to, through summer and beyond.